Samuel and Pirena are now no longer in the retail business. At 59 Samuel lists his profession as a residential carpenter. They live in by far one of the most expensive homes in the neighborhood. Pirena was the daughter of Supplina and Sarah Jane (Sumpter) Hamilton. A detailed account of the life of William Samuel Condit (Condon), known as 'Wild Goose Bill.' The account was published in the work 'Pioneers to Power, History of Grand Coulee Dam Area' published in April 1958 in typewritten form by the Grand Coulee Dam Area Community Development Study group. William Condit was the grandfather of Lottie Belle Condon who was the wife of Supplina Ward Hamilton. Supplina Ward Hamilton was the grandson of Supplina Hamilton. Jane (Sumpter) Hamilton was the wife of Supplina Hamilton and a matriarch of the Hamilton line that is largely documented on this site. 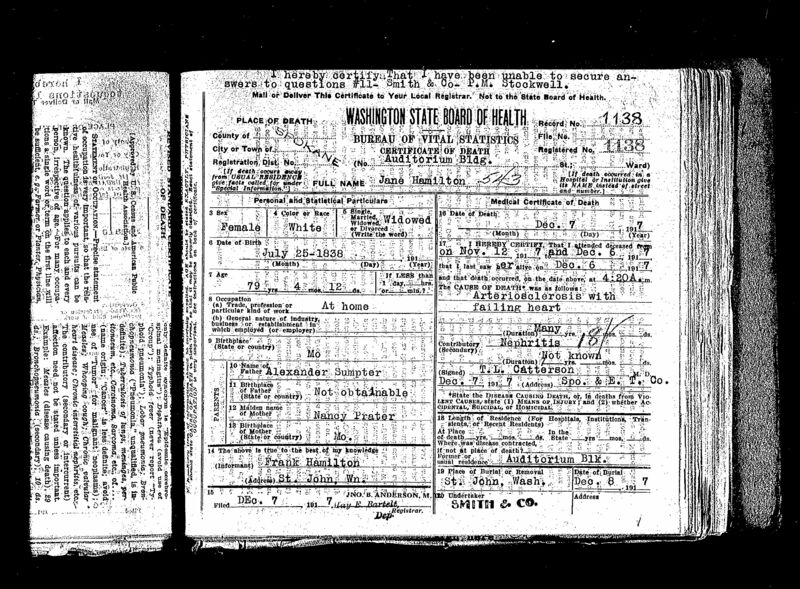 Her death certificate provides important information in filling out her vital records. This obituary contains misspellings / typos and a few inaccuracies. She died in 1917 not 1907. Her first born son was Duron not Durwin, etc. Jane was the wife of Supplina Hamilton. Mary Adelaide Spaulding was the wife of James W. Ramsay and the mother of Lillian Mae Ramsay. Lillian was the mother of Elsie Luetta Galloway who married Maurice Lake Hamilton. This essay explores what we know about the Spaulding family. 7) Suplina and Jane Judd Family: 1850 US Census. Uncle of Supplina Hamilton. Mason, Co. Illinois. Suplina Judd listed here was a son of Suplina and Jemina (Pooler) Judd. Suplina and Jemina had an older daughter, Altha, who married John Hamilton in 1815 and were the parents of Supplina Hamilton. Supplina Judd was born in 1774. He would have been 38 years old with a family in 1812. His son Suplina was born in 1808, so this had to be Supplina Sr. It appears from the records that Supplina served in two units from New York. One as a private and another as a drummer. Here's a note from the Library of Congress web site on the age of those men who served in the War of 1812: "Most of the men serving were of the usual military age (20s-30s), but a few were outside that range, such as Drury Hudson, who was 60, and Solomon Stanton, who was 54." This large PDF file (7.3mb) has four hand written ledger pages from the court records of Umatilla County, Oregon. These records detail Supplina and Jane Hamilton's land purchases in Umatilla County in November of 1862 and their subsequent sale in July of 1866. This PDF file has the family history record from the bible of Supplina and Sarah Jane 'Jane' (Sumpter) Hamilton. 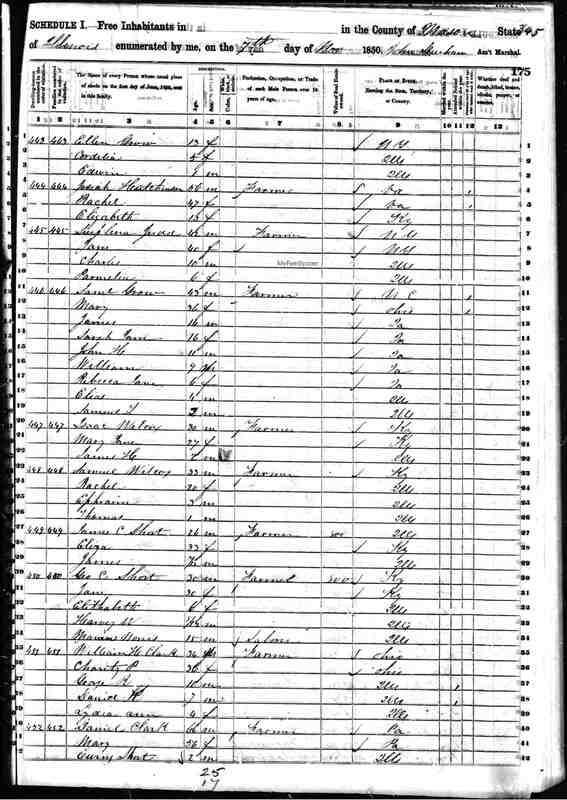 This record shows that though the Hamilton's were living in Linn, County Oregon in the 1860 Census and Marion, Co Oregon in the 1870 Census that they were in Umatilla, County Oregon during much of the 1860's. Supplina Hamilton is remembered as being appointed the first county Commissioner of Umatilla County in 1863. This single type written page summarized Joyce (Stover) Hamilton's research into the early Cass and Morgan County, Illinois school records searching for information on the John and Altha (Judd) Hamilton children. The Illinois School Records along with William M. (McCord) and James M. Hamilton's Civil War records and along some later Census records and voter roll records provide the evidence that we have to date of the Hamilton family in Illinois. The school records with the township and range survey coordinates, pinpoint (within a 36 square mile area) where Supplina was living in 1842. It was the Virginia Township, Cass County, Illinois. He would have been nine years old. It's interesting that he was not listed with his siblings of school age. They were perhaps living with different family members and / or friends in other townships as it's assumed that the family was orphaned around 1840. As Joyce notes in her research, the other Hamilton family in Township 14 N do not appear to be related. I've tried to tie them into our family... but the there is no evidence to date to show any relation. This is a PDF version of a grainy photocopy of a booklet that was published containing Supplina Hamilton's 'Last Sermon.' The sermon booklet was published 'by his request' after his death in 1905. The sermon puts forth a reasoned position on the time for the 'Communion or the Lord's Supper.' We (I) have no evidence that Supplina himself used the title, 'Reverend.' In fact, the title used by the Christian Church/Church of Christ in their documents is consistently 'Elder Hamilton.' Regardless, the editor or this booklet gives Supplina's name as 'Rev. S. Hamilton.' This copy was in the possession of Connie (Hamilton) Boone the daughter of Hugh Hamilton and the GGGranddaugher of Supplina. This is the file that cleared probate for Supplina Hamilton in Whitman County, WA in March 1905. Supplina named his wife Jane (Sumpter) Hamilton as his Executrix. 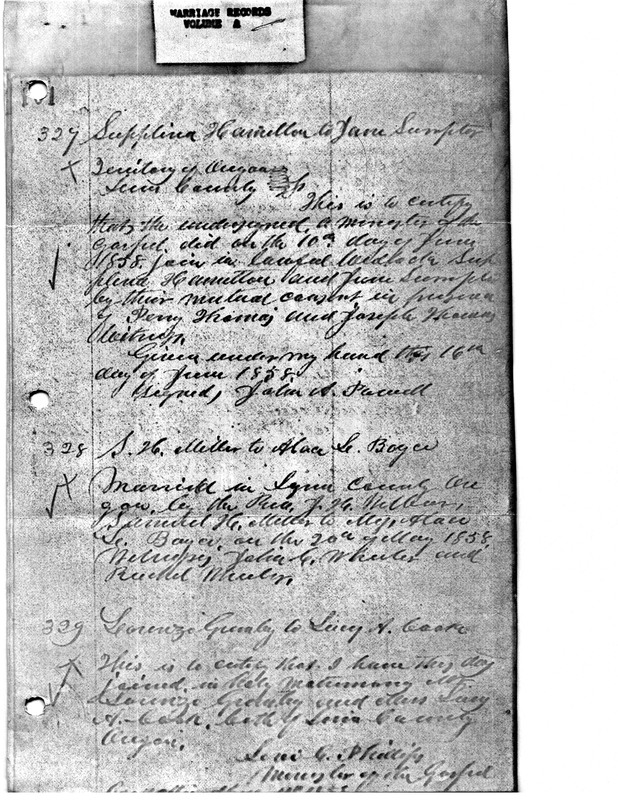 The will lists the names and residences of his children, his assets and confirms the location of the section of land that he owned Southeast of St John, WA. This PDF file preserves copies provide by Joyce Hamilton of Supplina Hamilton's obituaries and his letter of ordination by Christian Church Elders in 1867. This document proves that though Supplina's family was in Oregon in the 1860 and 1870 US Census that he was active in the ministry in the 1860's in the Washington Territory. Supplina helped found the Disciples of Christ Church in Dixie, Wa considered to the earliest church of that denomination in Washington. PDF file of Supplina Hamilton's patent record with the U.S. Patent office. Patent #705,401. Patent filed April 18, 1902 and granted July 22, 1902. Supplina Hamilton and Sarah Jane Sumpter Marriage Record. June 10, 1858. Linn County, Oregon. I believe this marriage register entry was based on a marriage letter certifying ('a certificate') to the county government that a lawful marriage occurred. Once the signed certifying document was copied into the county marriage record it was recorded and recognized by the state. "[Marriage of] Supplina Hamilton to Jane Sumpter. Territory of Oregon. Linn, County. This is to certify that the undersigned, a minister of the gospel, did on the 10th Day of June 1858, join in lawful wedlock Supplina Hamilton and Jane Sumpter by their mutual consent in presence of Perry Thomas and Joseph Thomas witnesses. Given under my hand this 16th day of June 1858. Signed, John A. Powell. 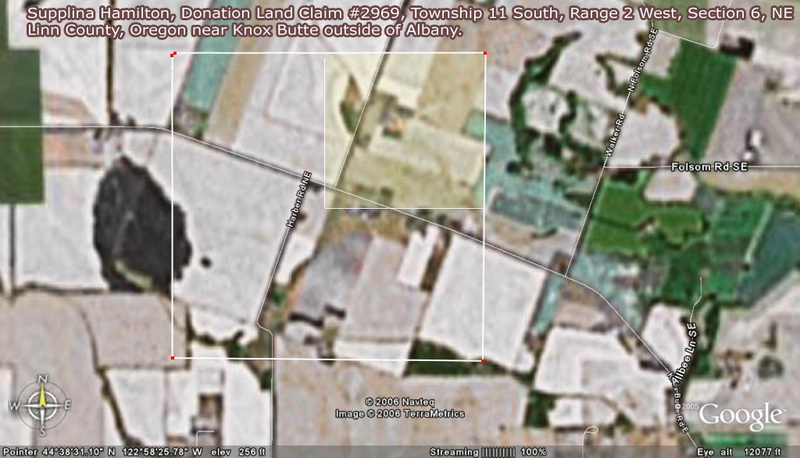 Close-up of the Supplina Hamilton Donation Land Claim #2969, Township 11S, Range 2 West on Sections 5 and 6. 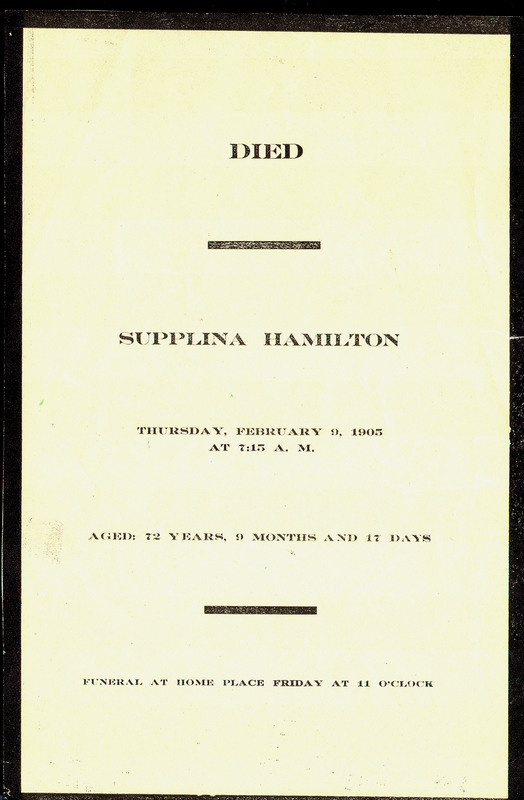 Supplina Hamilton family group sheets with obituaries. Detailed and accurate. Supplina (misspelled) and Jane's family record is at the bottom of the first page and continues on to the second page. This PDF document contains pages from the book, Powell History, written by James Madison Powell and published in 1922. JM Powell was medical doctor living in Spokane, WA and a direct decendant of John A. Powel the friend of Supplina Hamilton and Captain of the Powel wagon train of 1851. JM Powell wrote to Supplina Hamilton in late 1899 asking him to pen an account of the trip for his family history. Supplina obliged and in January of 1900 wrote a long and detailed letter to JM Powell telling of his memory of the trip West, as he 'saw the elephant' as a young man. We are indebted to the Powell family for asking Grandpa Supplina to write it and then publishing this wonderful letter. This index of Oregon Donation Land Claim Records shows Supplina Hamilton's claim and those of other Hamiltons. As far as we know, Supplina was not closely related to any of the other Hamilton Donation Land Claimants. Supplina Hamilton - Detail of Oregon Territory Donation Land Claim Record. This is from a 1953 transcription. This was the first transription of the record published beyond the National Archives. It was published on the 100th Anniversary of the end of the Oregon Donation Land Claim Program. This PDF file has a cover web page that gives the citation, the title page and the page recording Supplina Hamilton's claim. Joyce Hamilton inquired a number of years ago after Supplina Hamilton's Military Records (I believe with the State of Oregon). She was told the documents were too fragile to copy but the archivest hand transcribed them for her. These two pages are rich in information. One of the men who swore an affidavit as to Supplina's participation in the Yakima Indian War was George Miller. George kept a diary of this Company's time in the field. The affidavits may have been needed for Supplina to get a pension later in life and/or to receive the service medal that Supplina proudly wore on his chest in one of the later photos we have of him. Charles Dailey sent this very interesting document to us Today (11/10/2005). Mr. Dailey is the lead researcher at www.NWHistory.cc , which chronicles the history of the Disciples of Christ movement in the Northwest. Charles recently returned from the Disciples of Christ Historical Society in Nashville, TN. In the archives of the historical society Charles found the notes of a meeting Supplina Hamilton ('Bro Hamelton') was in near Waitsburg, Washington Territory in the third week of July 1875. Supplina was 42 years old at the time. This was the first annual meeting of the 'Disciples' in this area and it gathered churches from Eastern Oregon and Washington Territory. The Church of Christ ministers gathered to decide on their approach to evangelizing the area. They took formal minutes of their meetings and sent them to the 'Christian Record' and the 'American Christian Review' to be published. It is the record of their minutes that we have in the attached PDF document. At this meeting Supplina made the motion to set the next Annual Meeting on the 1st week of July 1875 in a grove on the W.P. Bruce place near Waitsburg, WA. This dovetails well with Aunt Effie's letter where she writes, "I was born in Waitsburg Wash. June 15, 1875 the eighth child of Supplina and Jane Hamilton during the first Christian camp meeting held in a cottonwood grove on the coppia [Coppei] Creek, it was an annual event for many, many years; my father was a minister of that faith, a pioneer, a black smith of no small repute in the early days in Washington where he lived for many years." According to the meeting minutes it was decided that Brother Hamilton's 'field of labor' for the coming year would be the country lying between Weston, Umatilla Co., Oregon, and Pataha Prarie, Walla Walla County, W. T.
In the 1880 Census, Supplina and Jane are living near Waitsburg, W.T. Supplina lists his occupation as, 'preacher.' Supplina is the head of the household containing their nine children including their oldest son, Duron's wife and two children. © 2003 ~ 2006 by Glen Hamilton, MyHamiltonFamily.com.